Let Sports World outfit your team with the best equipment and any other gear you need. Baseball, football, soccer, softball, and more. We carry the best brands at great prices. We make your shirts to order; we are equipped to handle any project in our store just for you. 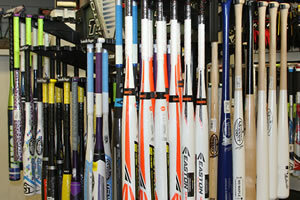 From Louisville Slugger to Easton and more, stop by Sports World and improve your game. Let us custom print your team shirts or uniforms right here in our store. It's that easy. We know sports. We are a local business and we support our local schools and businesses. Let us show you. Your one source for sports equipment and uniforms in Central Texas. 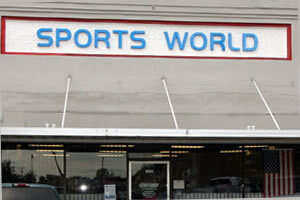 Sports World of Temple has been serving customers in Central Texas since 1974. Sports World is a retail sporting goods dealer carrying a great inventory in baseball, fast pitch softball and soccer items for the player of all ages. 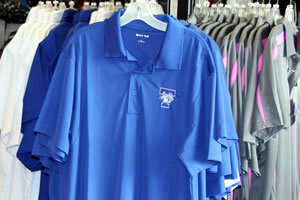 Sports World specializes in uniforms for teams in the area. If it you are needing a quote for uniforms, caps, visors, T-Shirts, give us a call and we will be glad to assist you. Sports World friendly and knowledgeable staff can help you find the bat, glove bat bag, that fits your player. We are NOT one of the big sports store chains, we have a staff with nearly 50 years of experience in assisting and helping customers, teams and leagues. Sports World in house screen printing and art department can design and deliver for you quality shirts and uniforms, quickly and on time. We also offer embroidery for groups, clubs, business and teams. Looking for a shirt and cap to wear for a local high school, Sports World carries a large selection of styles and school in stock. 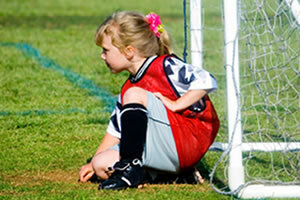 Whether your sport is baseball, softball, football, or soccer equipment, Sports World has you covered. Visit our store in downtown Temple today. Sports World specializes in team uniforms for all local sports leagues. From uniform shirts and pants to caps, visors, shorts, t-shirts and socks, we can help. Embroidered logo apparel, screen-printed t-shirts, or any custom need for your business or school, contact Sports World today for unbeatable quality and service. Don't see what you need? We are happy to answer any questions and fulfill any special requests that we can. Please send us an email, give us a call, or just stop by and we'll be glad to help.